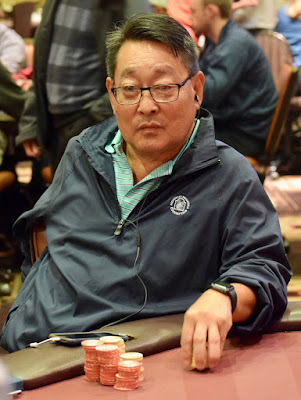 The action was nothing special preflop, Warren Kashiwagi and Sasha Sabbaghian to the flop. Sabbaghian looks a bit surprised when Kashiwagi slides a full stack of orange 5k chips in front of him on the 6-8-T flop. He does make the call, then sees Kashiwagi add 130,000 more on the 2 turn, putting two spades on the board. Sabbaghian asks to see how many total chips Kashiwagi has (~500k behind) and he moves all in. Kashiwagi takes about 15 seconds, and calls off his stack. Kashiwagi has Nine_Ten of Spades, top pair, a flush draw and a gutter to the 7 for a straight. Sabbaghian has Ace_Eight of Spades - a better flush draw and one over. The river is a red 6 and Kashiwagi is going to double through the massive chipleader.